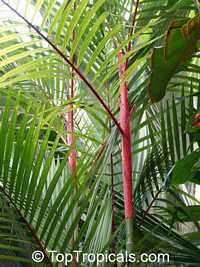 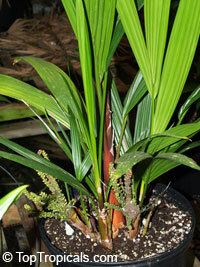 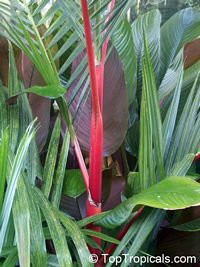 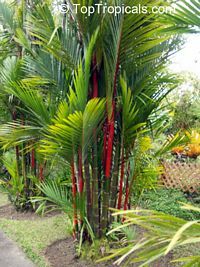 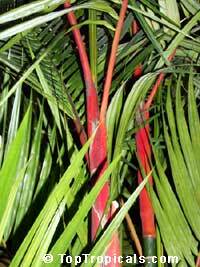 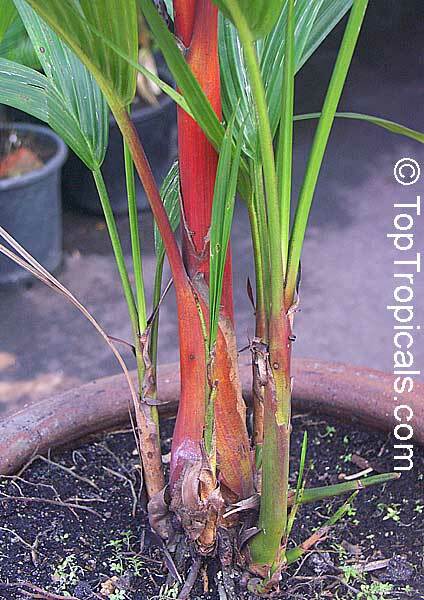 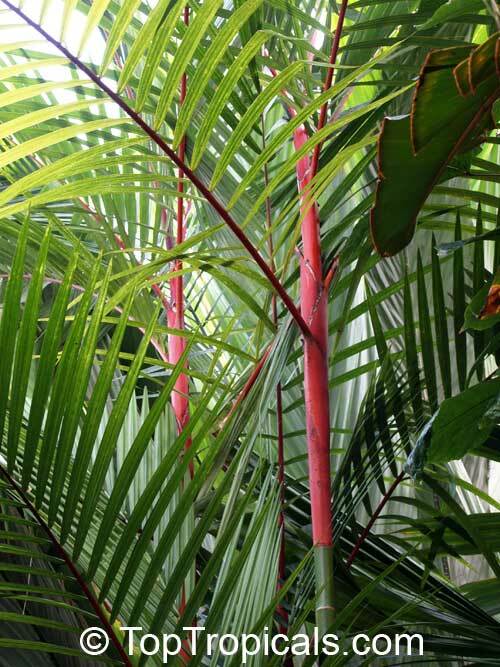 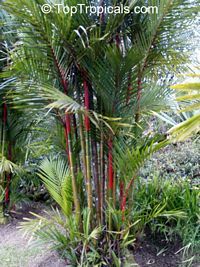 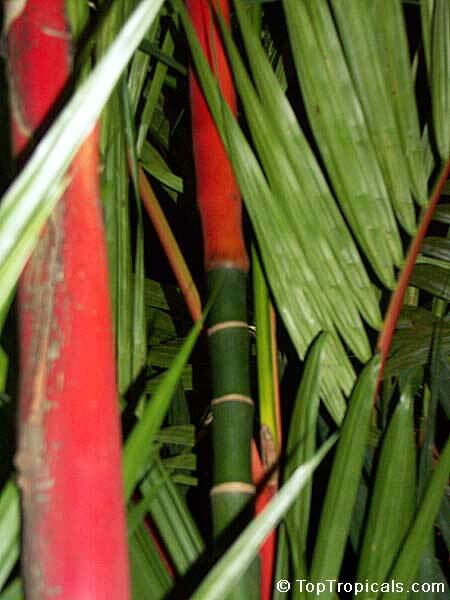 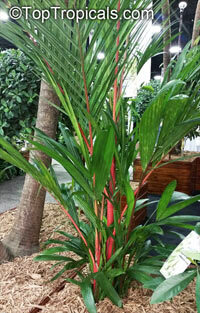 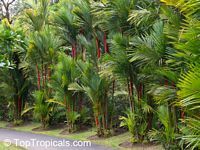 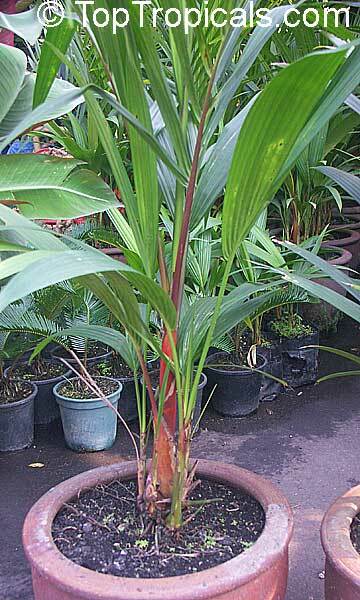 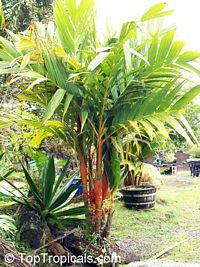 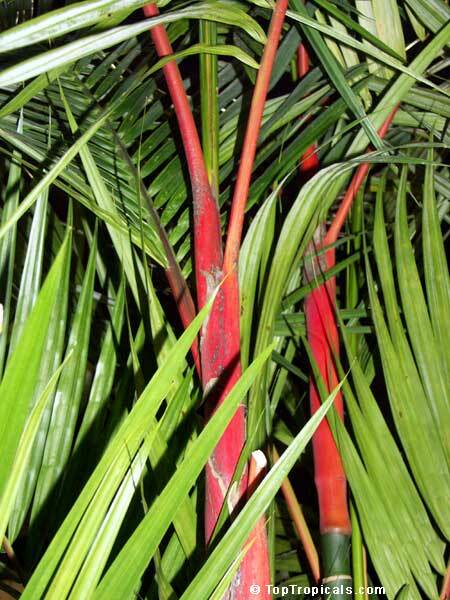 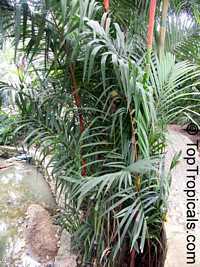 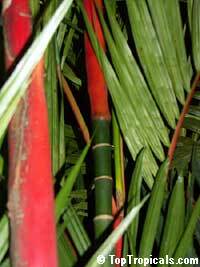 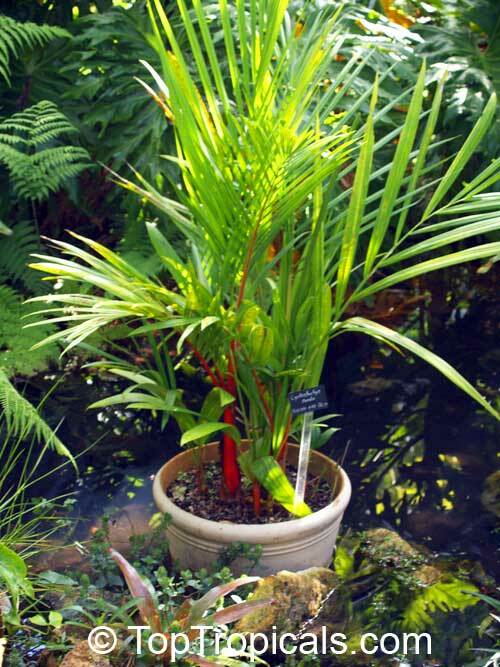 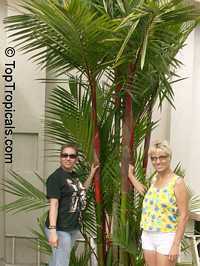 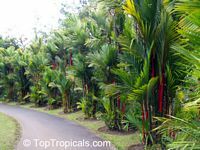 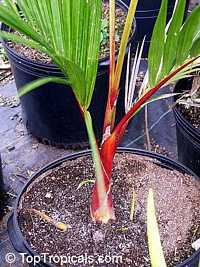 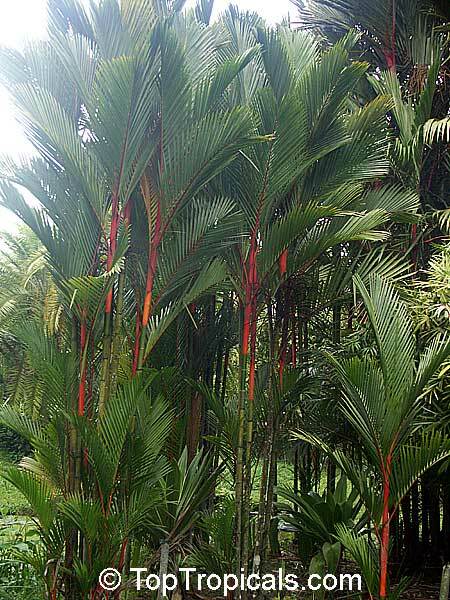 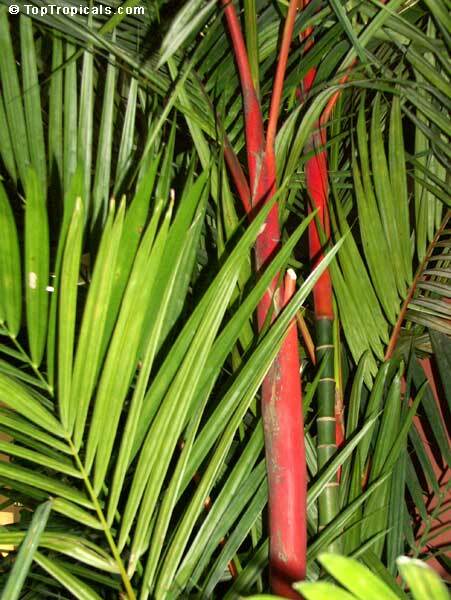 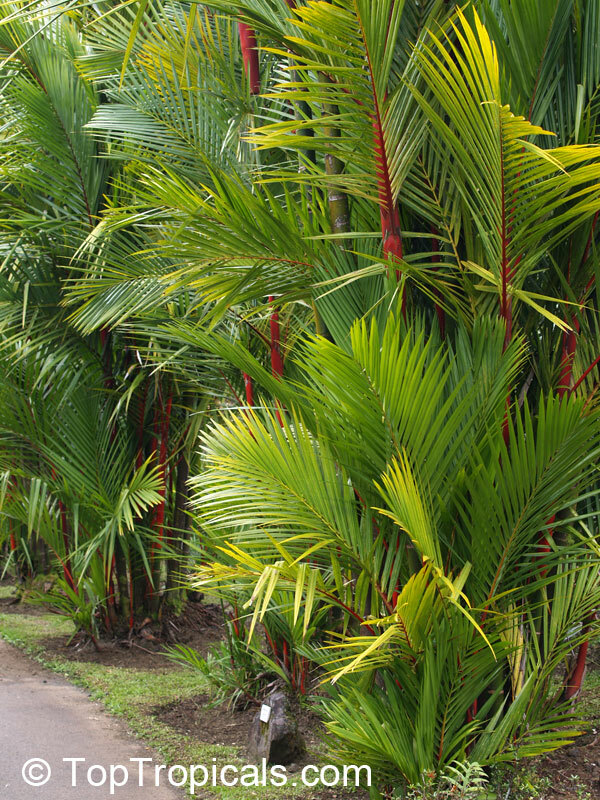 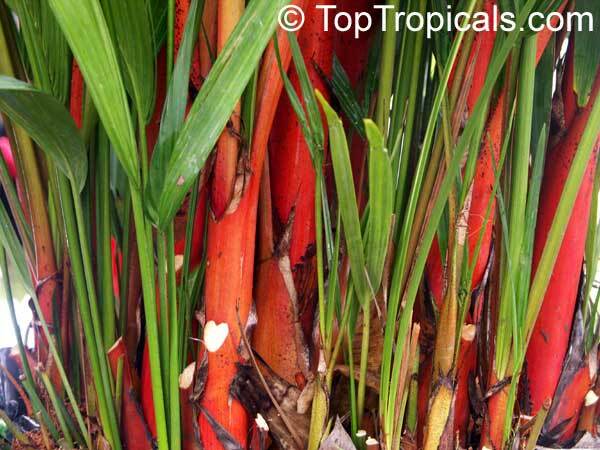 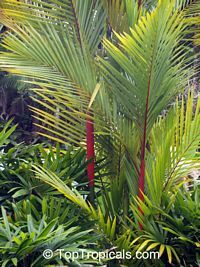 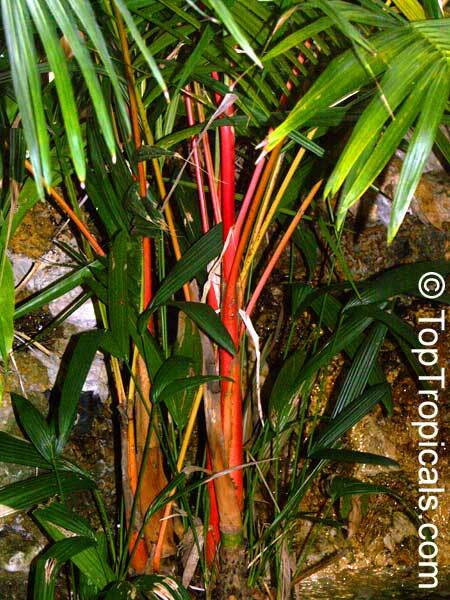 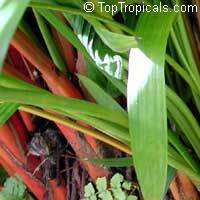 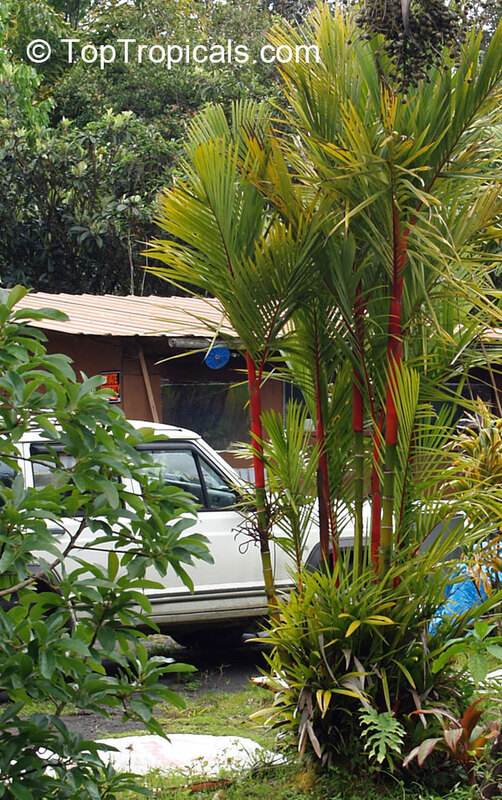 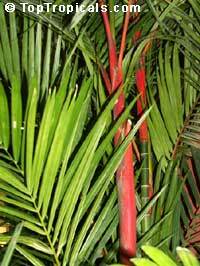 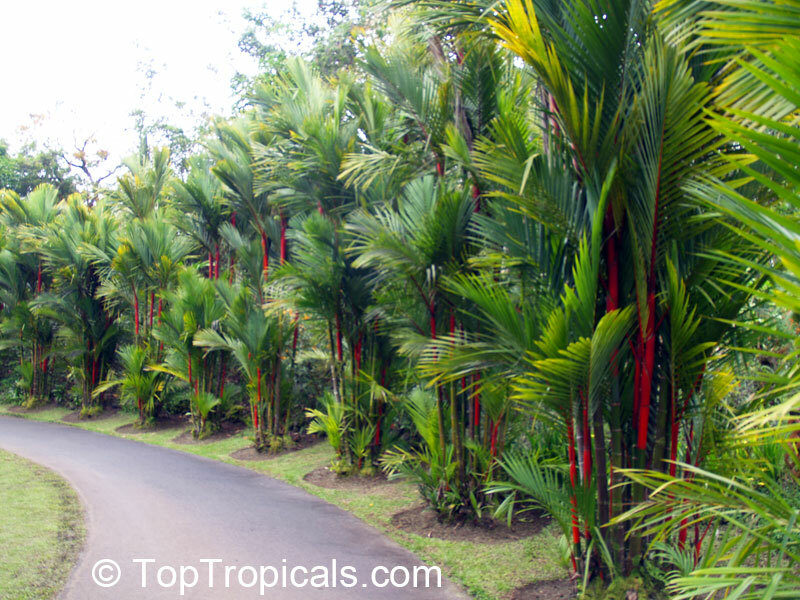 This stunning feather palm develops a brilliantly red trunk and is very hard to find. 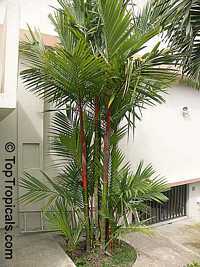 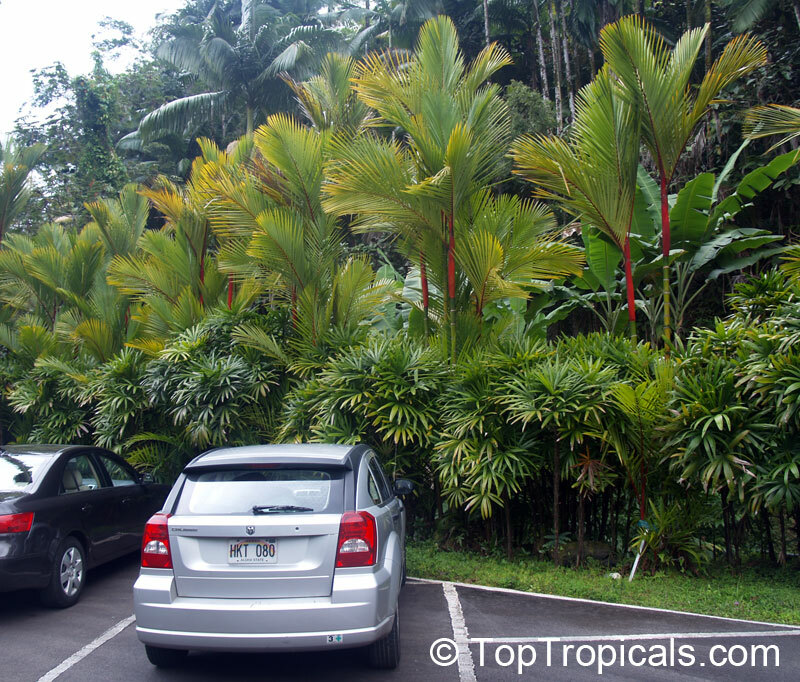 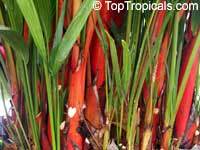 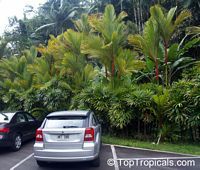 It is originally from Malaysia, has been introduced to Costa Rica, Puerto Rico, and other tropical areas of the world. Sealing Wax Palm seeds are very slow to germinate, up to a year. Young seedlings grow very slowly, but once the root system reaches 3 gal size container, the trunk will start turning red. 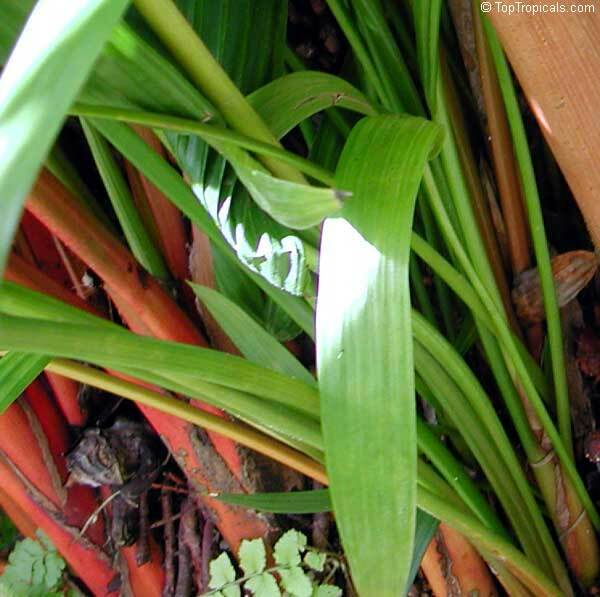 This may take another year or two, depending on conditions. 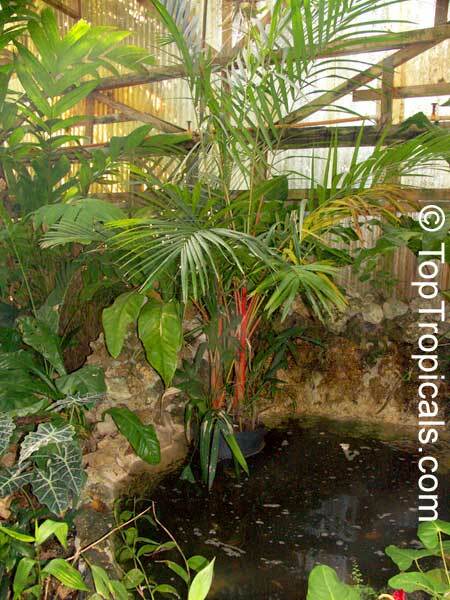 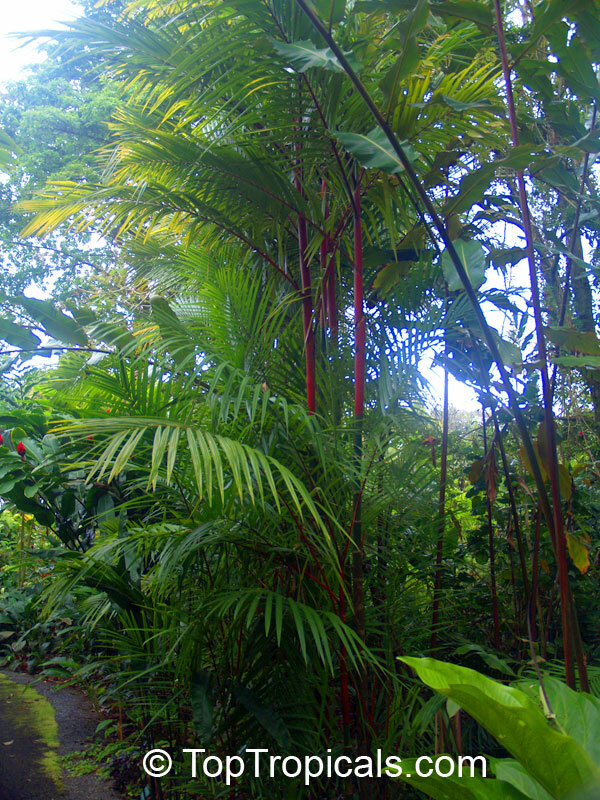 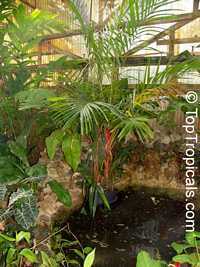 In warm tropical climates, it only takes a few months for 1-gal plant to develop into turning "red". 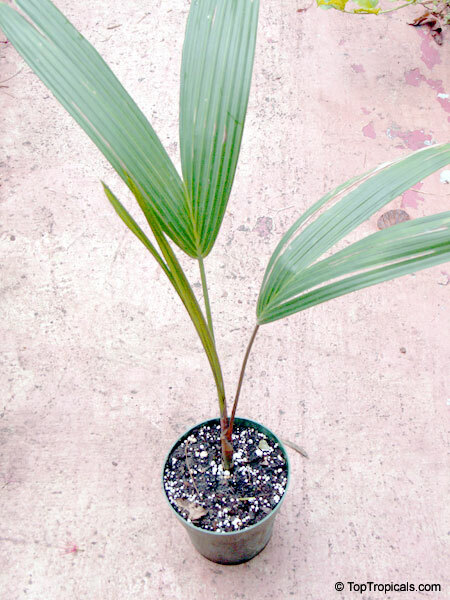 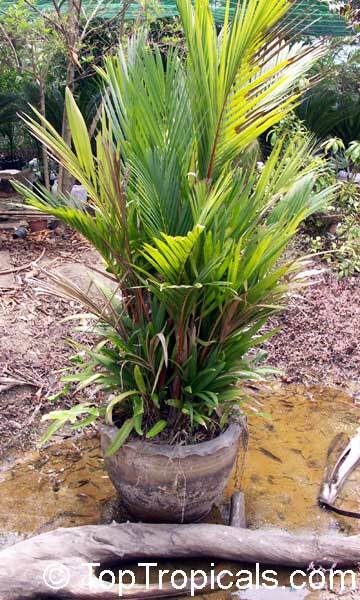 This palm will require a good overhead light, especially when grown indoors, and constant warmth. 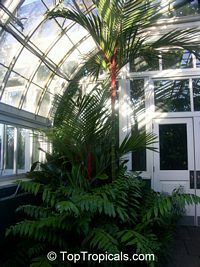 It's a cold-sensitive plant and for vigorous growth it must be kept above 50F, although in our experience, established plants can tolerate upper 30's for a short time. 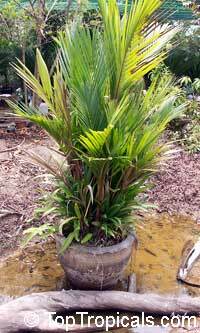 Soil should be rich, moist and loamy, and plant should be fed monthly with a balanced plant food. 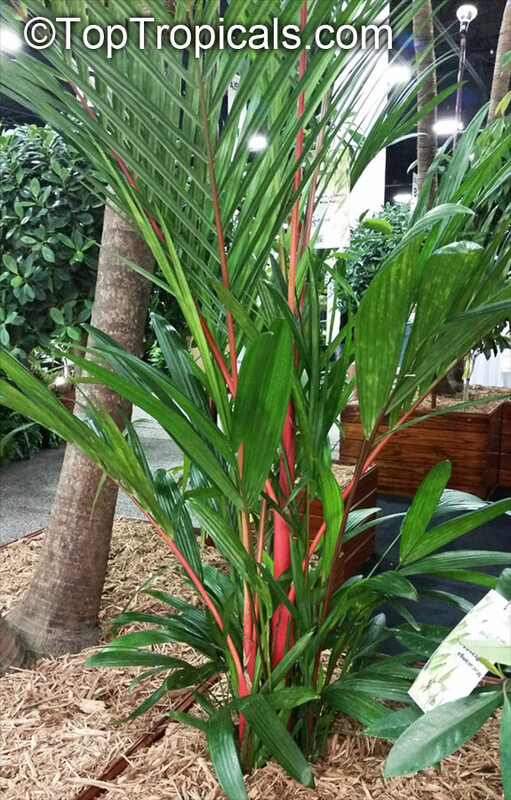 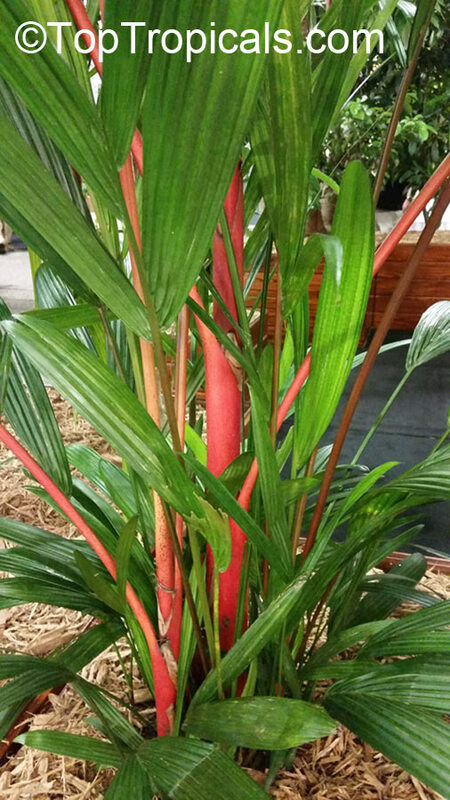 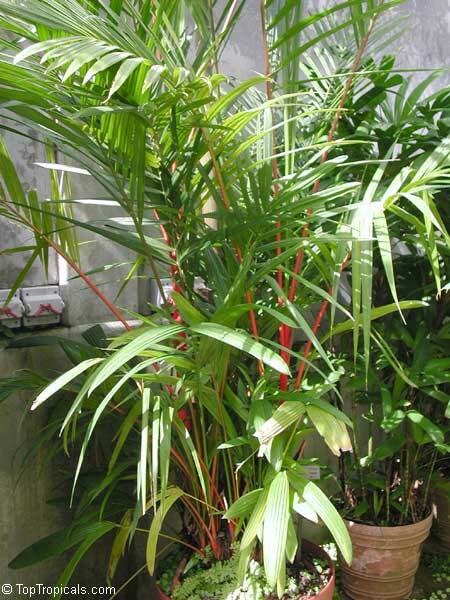 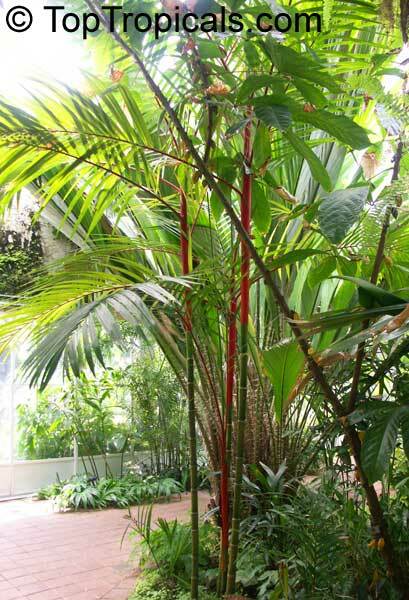 Providing a bright light, Red Lipstick Palm can be a wonderful indoor plant and a gem of any plant collection. 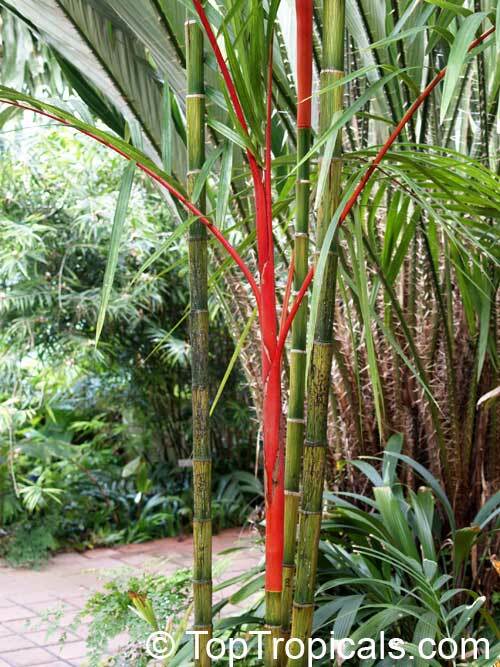 It's definitely worth an effort to grow this beauty! 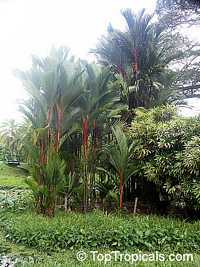 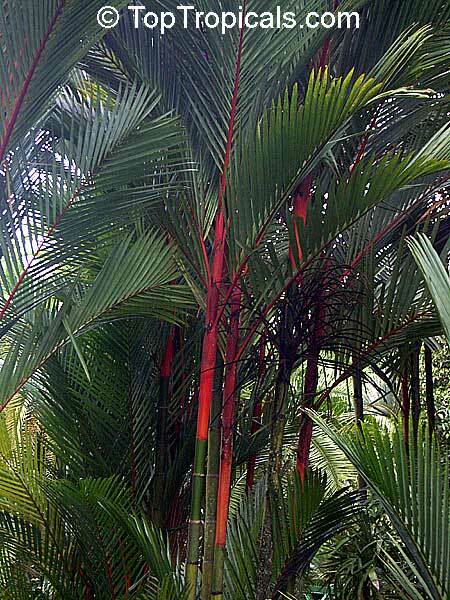 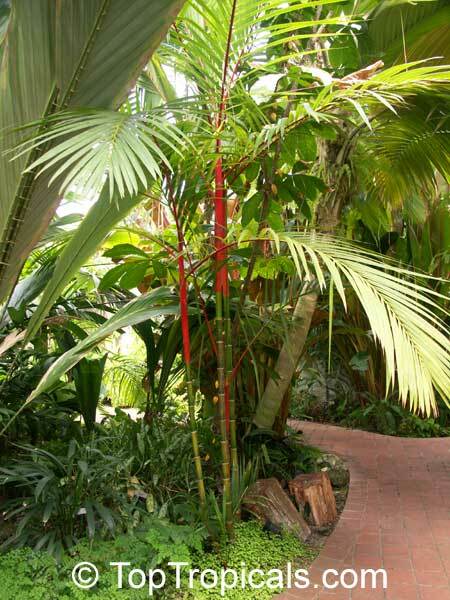 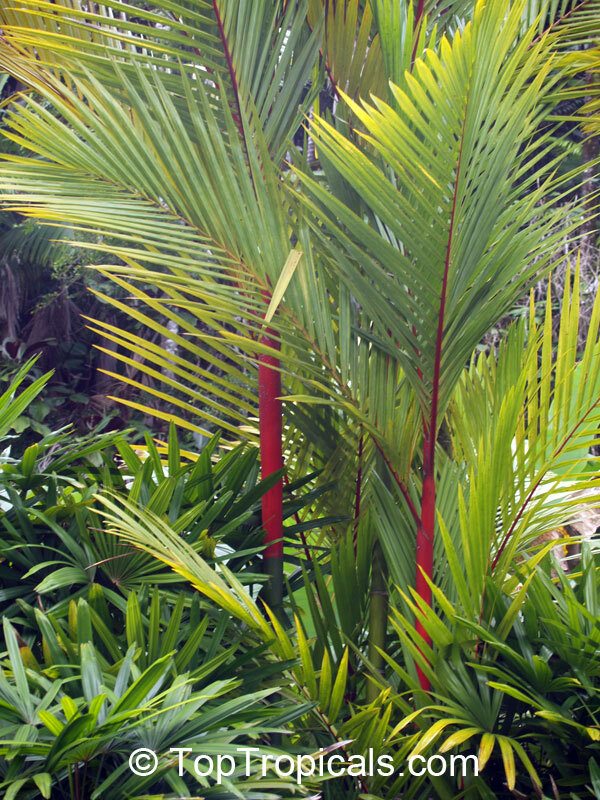 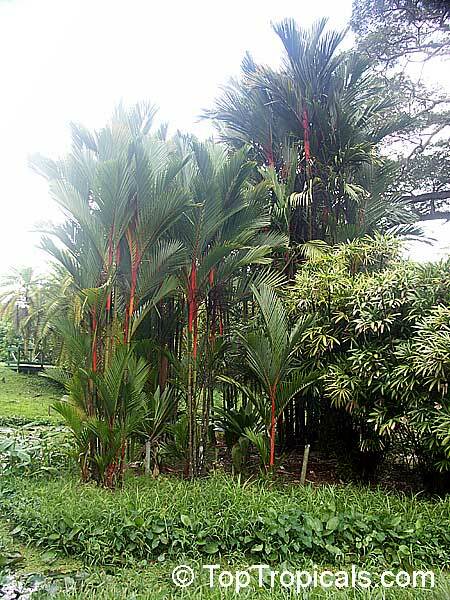 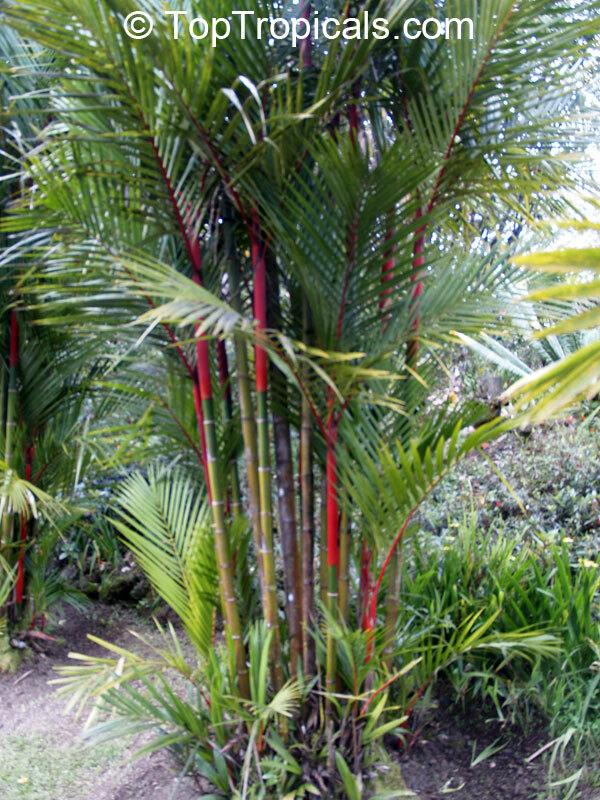 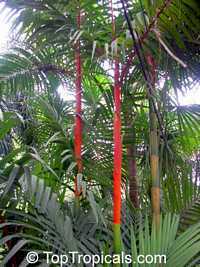 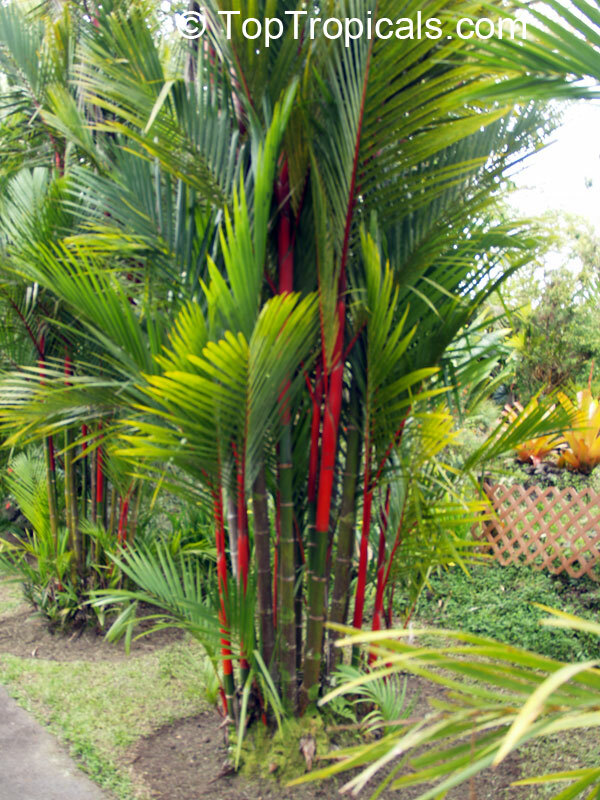 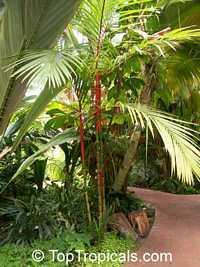 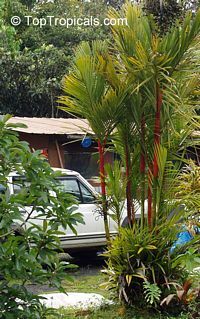 A stunning feather palm that develops a brilliantly red trunk. 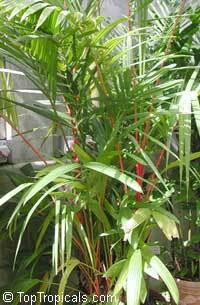 Requires constant warmth and bright light with high humidity. 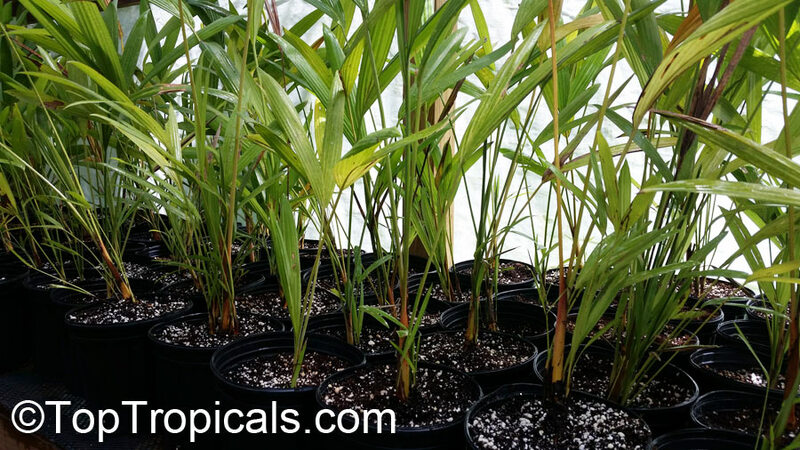 Ideal temperature for germination 80F. Plant seeds at a depth of 3/4" in well draining soil and keep damp.